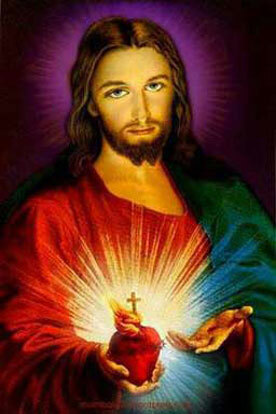 During the month of June the church focuses with loving reverence on the Sacred Heart of Jesus. 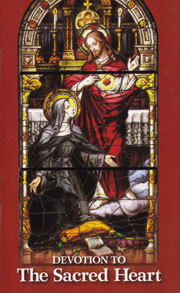 This devotion stems in part to church approved private revelations our Lord gave St. Margaret Marie Alacoque, a French Nun in the 17th century, in which He made known to her His desire for us to show love and devotion to His Sacred Heart. We have a special section of prayers about the Sacred Heart of Jesus here but I felt it appropriate to add some thoughts about the love flowing from His Heart in this blog entry as well. For starters, God doesn’t just love. He is love! (1 John 4:8) He sees each of our souls as if they were High Definition images with nothing hidden. And He desires our love us just as intensely! Christ sees us in HD and loves us in HD! We can requite our love for Him through partaking of his graces in communion and confession, and through prayer, fasting, and following His commandments. If this sounds like too tall an order as you deal with life’s daily struggles and vexations, remember that you can always say a short prayer to God, even in your own words, or use one or more of these prayers. Or just talk to Him as you would a friend. Tell Him you love Him. Ask for His help in doing His will. Express your gratitude for His blessings. Or tell Him about all your frustrations over everything going wrong in your life or in this crazy world! Mother Teresa once said that God did not call her to be successful, but rather faithful. That applies to all of us as well! The main thing is to keep in touch with Him and keep trying to live in His love! You can see touchingly tangible proof of Jesus’ unbounded love for each and every one of us (that includes you) every time you look at a crucifix. 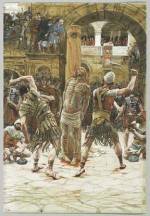 He willingly gave up His life for us in a most brutal fashion so that we might have Eternal Life with him in heaven! St. Paul wrote in his letter to the Romans that while one might find the courage to sacrifice his life for a good person, Christ died for us while we were still sinners (Rom 5: 7-8). And keep in mind as well that He would have made that same sacrifice just for you alone! In both public and church approved private revelations we get a sense of the intensity of God’s love for us. 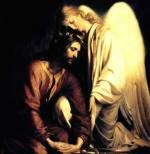 Jesus told his apostles in His Last Supper Discourse to “love one another as I have loved you” (John 13:34 and 15:12). And His love is anything but lukewarm or indifferent. He reproaches the church at Laodicea for its tepidity (Rev. 3:16). 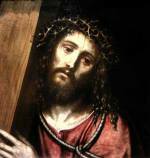 And as his life was ebbing away on the cross he said “I thirst” (John 19:28), a cry that theologians over the centuries have interpreted to signify more than just a physical thirst but a profoundly spiritual one for souls, including yours and mine in what St. Alphonsus Liguori called “His ardent desire to save all mankind”! Never forget that you were born with a God-given soul, one that our Lord values and loves no matter what your circumstances in this life! It is also prime real estate in the battle between Christ and Satan. Despite what atheists and some materialistic free thinkers might claim, there is indeed an afterlife, and each of us will either spend it the unspeakable joy of Heaven or misery in Hell, depending on how we’ve responded to God’s graces in this life. Admittedly, many of us are in the throes of various spiritual and emotional trials, especially these days! Mother Teresa herself felt both a dryness and emptiness in serving God at various times throughout her life. That is by no means uncommon, both for religious and the laity alike. Our prayers don’t get answered. Trouble seems to be brewing all around us. There are pressures at work, or with the family or such, that are just too much to bear! God allows us to undergo trials to strengthen our souls or cleanse them of sinful habits or inclinations. Yet, as hard as may be to believe, God is very much there with us through these struggles and wishes us to help Him bring whatever good we can out of bad situations, as well as out of evil, as discussed in part here. We are living in increasingly difficult and perilous times, both for our faith and for the world in general, and there’s probably a link between those two! It certainly feels these days as if we’re living in the times our Lord predicted when men’s hearts would grow cold (Matt 24:12). However, that could have been said during any number of brutal epochs in human history. Yet always remember Satan doesn’t have the last word. He didn’t at Calvary and he won’t now or ever. Stay close to Jesus in prayer and in partaking of His sacraments, even when, perhaps especially when, it seems he’s nowhere to be found. I find comfort in reading the psalms, where often the psalmist expresses hope that God will not abandon him in the midst of misery (see Psalm 22 for a well-known example of this). Trust that though He may not seem to hear you or your prayers, God has not abandoned you either, far from it!